Speaking of email marketing best practices, we heavily rely on our own experience. 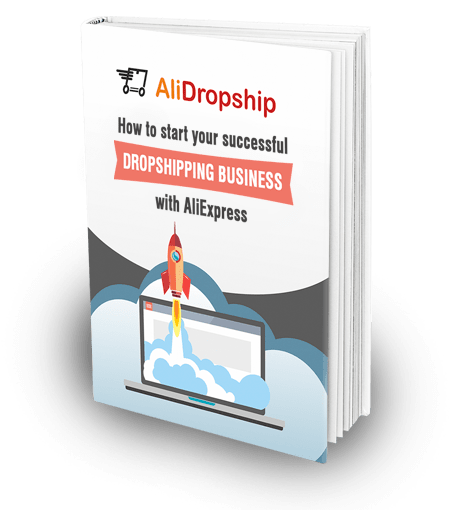 Here, we will talk about the tips and strategies that we have tested on our self-managed, money-making dropshipping stores! 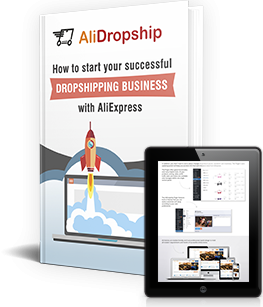 AliDropship team has dozens of self-owned stores. They are not made for clients: they are designed for our own use. On these websites, we test our newest dropshipping software, and experiment with various promotional strategies. Thanks to our efforts, in some time, even the newly created stores start getting thousands of dollars in monthly revenue! This is what lets us give professional and valuable advice to dropshipping newcomers! When we started running our first ecommerce store we made the same mistakes and had the same problems as any newcomers. Sometimes we had some sales, on other days we got some visitors, but more often we had no visitors and no sales. A familiar situation, when you’re just starting out, isn’t it? Anyway, we were eager to make our ecommerce store profitable and did our best to achieve amazing results. The main problem was that we couldn’t stand out from the crowd. Our marketing campaign was based on the things known to everyone – start a blog, use the most suitable keywords or promote the store on social media. They worked, but they didn’t bring what we wanted – huge sales. So we started analyzing what we do and came to the conclusion that our weak point was email marketing. 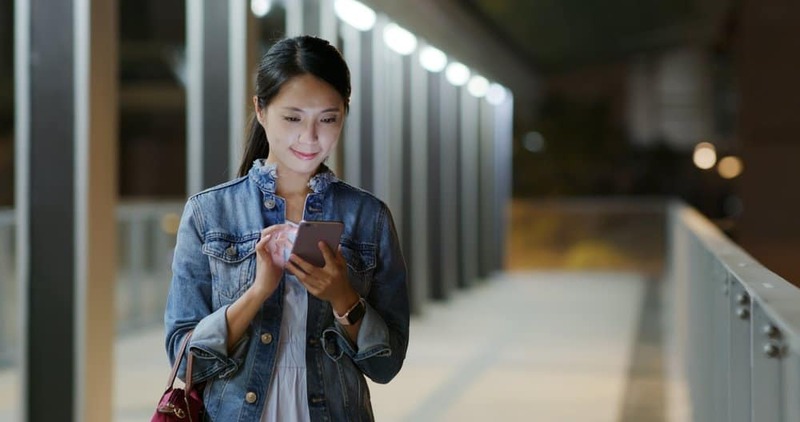 Emails are one of the most powerful ways to connect with our buyers. If we make them interesting or eye catching, people open them and go to our website. In other case, people just delete an email and label it as spam. So we started developing our own email marketing strategy that we are glad to share with you. Ladies and gentlemen, meet the best email marketing practices that we use to make people buy from us. If you’re wondering how to do email marketing right, above all you need to focus on a subject line. In fact, a subject line is the most important part of your email marketing strategy because it determines whether your email will be opened or not. Let’s look at a bad subject line and learn how to write a great one. 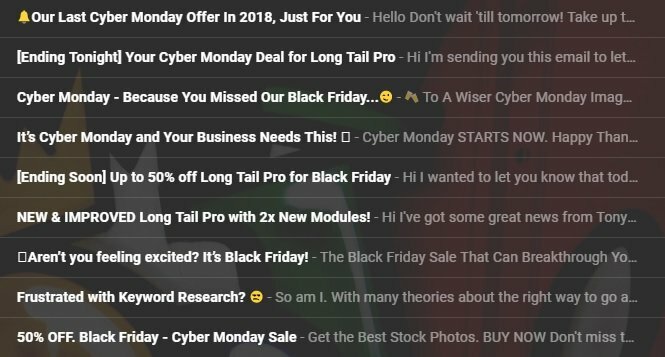 Here is a screenshot of my personal mailbox and what emails I received on Black Friday. As you can see, they all look exactly the same. As a person that gets thousands of emails every day, I will not open them because I do not see any difference. They all just tell me about a big sale event but I already know that it’s running! These subject lines do not tell me WHY I should pay my attention to these emails and open them. If you write something like this and have the same difficulties, below are 5 email marketing tips that we use to make our subscribers click on our emails. Don’t write in your subject line the general phrases “Black Friday starts now” or the phrases such as “Are you excited?” or “Do you have a sec?” because they do not make any sense! Your header must be informative and useful for people. Ideally, when reading your subject line, the recipient has to evaluate the importance of your email without opening it! This subject line gives me information about the duration of this sale – “weekend” and the benefits I can get – “extra 20% off all items”. As a user of this store, I can easily judge whether this offer is valuable for me or not. A great subject line must include from five to nine words. The reason is very simple – about 70% of all emails are read on a smartphone or a tablet. They display from 25 to 30 characters whereas a desktop shows people about 60 characters. If you write lots of text, your clients won’t get the main message at all. For example, this subject line consists of 5 words and shows that the store is ready to offer you a new Christmas collection. Your aim is to only open the email and check it out. If you have something to number, do it. Numbers are a great way to set your subject line apart, demonstrate a clear message about what you offer and set the right expectations. Writing in your subject line something like “Big sale! Buy from us!” is a bad idea that can easily lead to misunderstanding. People will not know on what products or product categories you offer a discount and what exactly the “sky-high discounts” mean. As for me it means that I get a product with at least 30% discount while my mother thinks that the discounts should be not less than 70%. However, after opening an email and seeing “15% OFF” we both will be disappointed although a discounted price is ok. Why? Because we have expected another offer. What’s more, “5 tips on how” or “7 ideas to” will show your clients that it won’t take much time to go through your list and they will get benefits from opening your email and reading it. When you write your subject line in all capital letters, it looks as if you’re yelling at your subscribers. People will definitely notice your subject line, but will they open your email? I doubt it. These headlines look spammy and the anti-spam filter will probably block them. According to statistics, more than 85% of respondents prefer headers, which are written in small letters and doesn’t have lots of exclamation points. However, if you write only some words in all caps, it won’t be annoying for people. Instead of writing all text in caps, we recommend you to use emoji or symbols in your subject lines. These bright pictures will definitely draw people’s attention and increase your open rates. The modern email services show users not only the subject line but also a preview text. As a rule, this is the first line of your email that tells your subscribers more about the content of your email. If you don’t pay much attention to it, you make a big mistake. The subscribers usually perceive the preview text as a part of your subject line, so it can strongly influence whether they click or not. Let’s look at what you can write in your preview text. If you offer a discount, write in your preview text the words that could precise the information and therefore increase your open rate. If you have something else to offer, write about it in your preview text. It may happen that people won’t be interested in your first offer, but the second one made it open your email, go to your website and make a purchase. Even if you don’t have anything special to offer, do not give up and write about your advantages, for example, about free shipping or new products in your store. A great email should have a very clear structure. In other case, it will be very difficult to appeal to your readers’ emotions and make them take an action. Don’t write too many words! Think about the message you want to deliver to your customers very carefully (promo codes, special discounts, etc.). Write in the second person (red stripes) and personalize if it’s possible. It means you should use the words “you, your, yours” and try to address to your customers by name. So your copy will be oriented towards the reader. Use actionable language (green stripes). A good email must have calls to action that will encourage your subscribers to go to your website. Sometimes it’s better to use a picture instead of words. They grab people’s attention. Research indicates that visuals increase a person’s willingness to read content by 80%! Creating pictures is not a tough thing. Nowadays there are lots of free design makers. If you can use Photoshop or CorelDraw, it’s better to make them there. However, if you don’t have this superpower, we recommend you to pay your attention to the following tools. This graphic design tool is perfect for making display ads, infographics and images for blogs, emails and social media. It has thousands of templates that look very professional and allows you to earn more customers and clicks. With this design maker you can create any types of design elements you want – posters, covers, logos, banners, etc. After designing an image you can save it on Fotor cloud and get easy access from anywhere in the world. With this tool creating any type of ad is as easy as ABC. It is easy to use and has lots of beautiful images and great options that help you create your perfect ad. Stencil is a paid tool, but some features you can use for free. Here were the most powerful email marketing practices that really work and make people buy from us. This is what lets us significantly increase the number of sales, grow our audience and earn tens of thousands of dollars every month. Start following these tips right away and the effect won’t be long in coming! P.S. You don’t have a large email database yet? Don’t worry – we’ll dedicate one of our upcoming articles to this issue! Subscribe to our blog to stay informed about our newest discoveries, and learn how to collect clients’ and visitors’ emails for a super efficient promotion! Thank you, Sasha. You are amazing!